I’m sure that scooters are a very popular gift idea for kids and teenagers this Christmas. Anything that gets them away from a screen and out into the fresh air can only be a good thing! And, unlike most bikes, you can do some really cool stunts with a scooter – as long as you take the necessary safety precautions of course. 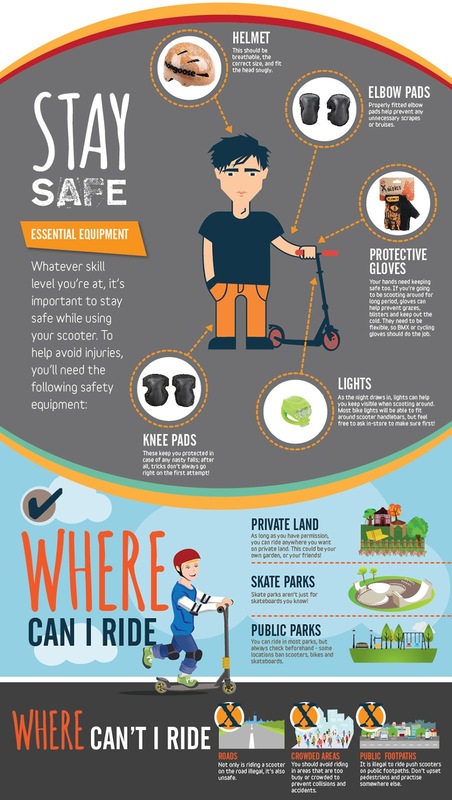 With this in mind, Halfords have come up with a great guide containing scooter tips and tricks. The guide is for beginners to give them some cool insider knowledge and it’s got step by step guides to tricks, information on essential equipment and the best places to go scooting around. Did you know, for example, that it is actually illegal to ride a scooter on the road or a public footpath? I’ve included a couple of the easier moves for you but why not check out the full guide HERE. Safety equipment is so important, particularly if your child falls over with every gust of wind, like Ieuan seems to at the moment. Head gear, in particular is crucial. I see so many kids riding scooters with no protection to their delicate heads at all. These should certainly keep my two entertained for a good while and give my ears a break from the constant Harry Potter and Star Wars theme tunes which indicate the children are in the house somewhere! And I’m sure we’ll all welcome the chance to get out of the house over the Christmas break. There are only so many times you can watch “The Empire Strikes Back”, aren’t there? "7 Tips For Easier Meal Preparation This Christmas"
"Creating the Ultimate Kid’s Bedroom"